Helping you protect yourself from online deception and scams. Created by private investigator Julia Robson, CupidScreen is a background checking and investigation service specifically designed for those who date online. The safest way to protect yourself and those closest to you when dating online is a CupidScreen. Operated by private investigators, we personalise every investigation. 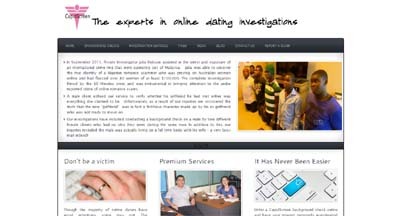 Our investigations have included travelling to Malaysia to arrest an international crime ring of romance scammers.